At 290 days, -a wait well worth it I’d say, as another HoF headliner joins the club, in the name of Bob Griese. I had given up on Bob, and when I got the envelope back I must admit that I was surprised and pleased with his response. Bob had an impressive career at Purdue for the Boilermakers playing football, basketball, and baseball. He’d play quarterback for the Boilermakers from 1963-1966. It wasn’t until his Sophomore season in 1964 that Bob took the reins and start as the team’s quarterback, punter, and kicker. In 1965 he led Purdue to a 25-21 upset of #1 ranked Notre Dame. As a starter he’d post a 22-7-1 record. In his senior season, Griese led the team to a Rose Bowl victory over USC 14-13 in what is considered the school’s signature victory. Bob was a smart QB and what he couldn’t do with his arm, he’d frequently do with his legs. His final numbers set precedence for the school’s modern era quarterbacks such as Jim Everett and Drew Brees to break. Griese was drafted in the first round of the 1967 AFL draft by the Miami Dolphins. He’d have 15 TDs passing, 2005 yards, and 157 yards rushing his rookie season- good enough to earn All-Star Honors, despite starting the season originally on the bench, and for an expansion franchise. He’d grab All-Star honors the next season as well with 21 TD passes. 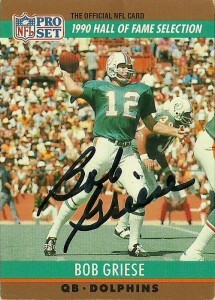 Still, the team continued to struggle with winning, and Griese was becoming known as a good quarterback on a bad team. Don Shula was brought in to coach the team in 1970, and Griese guided the team to a 10-4 record. At the conclusion of the season, Bob was named MVP of the league, but the team fell in Super Bowl VI against the Dallas Cowboys. The Dolphins came back with a vengeance the next season, and steamrolled opponents in 1972, going 14-0. While Earl Morral came in to replace Griese during the season due to injury, the team returned to Bob in the playoffs to help them win the Super Bowl. Griese capped off Super Bowl VIII as well with a victory over the Minnesota Vikings. By 1977 Bob began wearing those iconic black rimmed glasses on the field, but new powers began to rise in the AFC in the Central division, with the indomitable Steel Curtain in Pittsburgh and the Houston Oilers ground game led by Earl Campbell. While Griese continued to post good numbers and the Dolphins posted solid records, they wouldn’t return to the Super Bowl again. After the 1980 season, Griese retired. The Dolphins had David Woodley waiting in the wings, and he’d guide the team to another Super Bowl loss, before Dan Marino took the reins in 1983 and rewrote all the record books for the franchise. Griese kept close to the game and did color commentary for many years at the college level. He also handled color for the Dolphins’ preseason games as well. He’s enjoying now full retirement, in Florida and was inducted into the Pro Football HoF in 1990, the College Football HoF in 1984, the Dolphins Honor Roll, and had his number retired by the franchise as well.